If you are looking for a weekend getaway from Jaipur where you can just laze by peaceful places, then you must plan a trip to Mathura. The birthplace of Lord Krishna, Mathura is one of the most visited places in India and is a highly revered pilgrimage site amongst Hindus. Even though the exact history of this beautiful city is still unknown, it is said to have been flourishing for thousands of years. Due to its relation with Lord Krishna, it has become a religious site over a period of time. However, it also houses several historical monuments which help in tracing the history of its existence and survival. The presence of a serene atmosphere and divine aura within the boundaries of Mathura will certainly rejuvenate your mind, body and soul. You can also enjoy the beauty of a spiritual environment. Read on to know in detail about Mathura and its tourist spots. For Hindu devotees, Mathura is a year-round destination. However, it is mostly visited during the month of Janmashtami, an annual festival to celebrate the birth of Lord Krishna, which usually falls in the month of August and September. During this period, Mathura gets flooded with millions of Hindi devotees, seasonal tourists and photographers. If the weather is taken into consideration, then the best time to visit Mathura is from October until the end of February. By Air: Kheria Airport at Agra is the nearest airport to Mathura at a distance of about 58 km. From Agra, you can either take a direct train or catch a direct bus to Mathura. It will take an average time of 1 h to reach your destination from Agra. By Rail: Mathura is well connected to Jaipur and other major cities by rail and hence, you can catch a direct train to Mathura Junction. It will take you an approximate time of 4 h 30 min to reach Mathura from Jaipur by rail. By Road: Mathura has a good system of roads and hence, it can be easily approached by road. You can either hire a direct cab or catch a direct bus from Jaipur to Mathura. On your way, you can take a break at Bharatpur and explore its natural as well as historical sites. Bharatpur is located at a distance of about 185 km from Jaipur and 37 km from Mathura and is popular amongst tourists for Keoladeo National Park, which is a UNESCO World Heritage Site and is frequented by tourists from all over the world. As Bharatpur is an ancient town and dates back to the period of the Jat rulers, you can also find several historical sites here. The major places which shouldn't be ignored on your trip to Bharatpur include Bharatpur Palace, Lohagarh Fort, Keoladeo National Park and Government Museum. Mathura is located at a distance of about 225 km from Jaipur and is an ideal location to spend your weekends amidst serenity and composure. On one hand, you can indulge in exploring the beauty of its divine temples and on the other hand, you can laze by its historical sites and learn about the history of Mathura. Following are the major places in Mathura which no traveller can afford to miss. Unarguably, the most important site in Mathura, Keshav Deo Temple is said to be the birthplace of Lord Krishna and therefore, it is considered as one of the holiest sites in the world amongst Hindus. Even though the temple has gone through destruction and renovation several times in the past, its divine beauty is still intact, thereby, alluring tourists from all over the world. 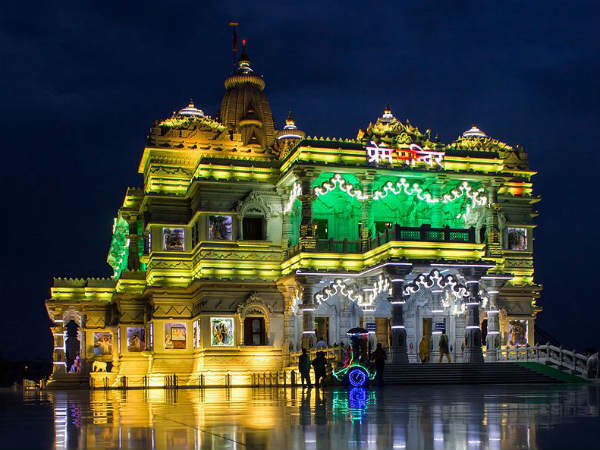 Located in the twin town of Mathura, Vrindavan, where Lord Krishna spent his childhood, Prem Mandir is a love temple dedicated to the pairs of Lord Krishna and Goddess Radha and Lord Ram and Goddess Sita. The temple is a newly built structure and is spread over an area of about 54 acres. Surrounded by a colourful garden, this heavenly site is a perfect place to take a break amidst peace and calmness. Another temple dedicated to Lord Krishna which deserves to be explored, Dwarkadheesh Temple is one of the oldest temples in the region and is said to have been established in the year 1814. Since then, it has been a major religious site in Mathura and is visited by millions of tourists and devotees every year. If you wish to explore the history of Mathura and are looking forward to learning in detail about its glorious era, then Mathura Museum is one place you should visit. Established in the year 1874, it houses a vast collection of age-old artefacts, ranging from paintings to sculptures and coins to pottery. It is one of the most visited museums in India. Another beauty where you can learn a lot about the bygone era of Mathura, Kusum Sarovar is a historical sandstone monument and is considered as a site of historical as well as religious significance. The Narada Pond located beside the monument is the place where the Vedic sage Narada wrote several devotional verses thousands of years ago. Isn't it a perfect place to enjoy history, spirituality and nature simultaneously? Apart from the above-given places, you can also get yourself to other beautiful places like Vishram Ghat, Krishna Balaram Mandir, Birla Mandir, Banke Bihari Mandir, Radha Raman Temple and Jama Masjid.